The Liberal Democrats nationally are calling for: “an in-depth inquiry into the use of TASERs before they become commonplace on British streets”. The call was made by Liberal Democrat Home Affairs spokesman Chris Huhne in a statement he made following the release of figures on TASER use against under-eighteens in the UK in response to a parliamentary question he had put down. However where Liberal Democrats are in positions of power and influence they are not using that to challenge the proposed deployment of TASERs to all response police in the UK. I have been lobbying Kevin Wilkins, a Cambridge Liberal Democrat and member of Cambridgeshire Police Authority asking him to ensure the authority discuss the proposed expanded TASER deployment. I got Mr Wilkins to make a public commitment to try and raise the item at the December Authority meeting but he did not, and it still wasn’t on the agenda for the February meeting. Mr Wilkins has written to me justifying his inaction by saying that he believes passing a motion at the police authority will achieve very little. Within hours of the November 2008 ministerial announcement on the extended deployment the Metropolitan Police Authority decided not to extend TASER use to all front line response officers in London on the grounds that they may cause fear and damage public confidence. It is now three months since this announcement and Cambridgeshire Police Authority are yet to react. I will be writing to Mr Wilkins drawing his attention to what Mr Huhne is calling for; and suggesting to Mr Huhne that he gets in touch with Liberal Democrat members of Police Authorities and encourages them to oppose the deployment there. This will be futile as Liberal Democrats do not have consistent views on policing (or as far as I can tell anything else from transport to budgets). Cambridge Liberal Democrat County Councillor Julian Huppert has stated “We have no democratic control over the police in the UK” he appears to believe that is an acceptable state of affairs and uses it to justify his disinterested attitude with respect to policing which he shares with many of his Cambridge party colleagues. I support firearms officers having TASERs as an alternative to guns, but do not want to see the police routinely armed with TASERs. 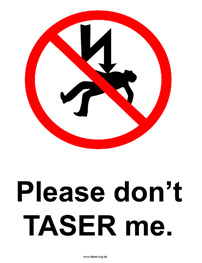 I believe any expansion of TASER use would be damaging to the relationship between the public and the police. This entry was tagged Cambridge, Police Authority, Taser on February 25, 2009 by Richard Taylor. I have written to Kevin Wilkins, who is the only elected representative of Cambridge on Cambridgeshire Police Authority and a Liberal Democrat. Mr Wilkins works for Cambridge’s MP David Howarth. It strikes me that as a member of Cambridgeshire Police Authority you are in a good position to attempt to enact Liberal Democrat national policy on a local level here in Cambridgeshire and ensure that the Police Authority properly investigates the use of TASERs before it makes a decision on their proposed expanded deployment. You also stated in your last email [to me] that: “there is no intention to deploy TASERs routinely”. The routine arming of all response police is exactly what the Government is proposing (*), and is providing the weapons to enable(*). If Cambridgeshire police have made a decision that they have no intention to deploy TASER routinely that is something I would welcome, and think ought be publicised. Could you clarify if Cambridgeshire police have made any such statement, and if they haven’t – on what basis you believe “there is no intention to deploy TASERs routinely”. I am writing having read of your call for: “an in-depth inquiry into the use of TASERs before they become commonplace on British streets”. I strongly support what you are asking for. I would like to suggest that one way of furthering that this element of Liberal Democrat policy is enacted would be for you to encourage Liberal Democrat members of police authorities to ensure that police authorities make the final decision on any expanded TASER deployment. Part of that would involve making sure members of Police Authorities are properly briefed with the information they require to make such a decision, the outcome of the inquiry you are calling for would form a key part of that briefing. I live in Cambridge where the city’s only elected member on the Police Authority is a Liberal Democrat, yet he has failed to ensure the expanded TASER deployment is discussed by the Authority. He has written to me to express the defeatist point of view that: “passing a motion at the CPA would achieve little”. I have pointed out to him that this is a strategic matter with the potential to massively change the nature of policing in the UK and therefore firmly within the remit of the authority. I have also drawn his attention to a statement by Vernon Coaker the Home Office Minister of State for Policing, Crime & Security who has said: “the number of Tasers that a force has is not dictated centrally. It is a matter for individual chief constables, with their authorities, to determine what they should have”, this I believe makes the role of Police Authorities very clear. If you are serious about the Liberal Democrats operating as a political party, acting consistently across the UK then I think you ought be providing guidance to your party members on police authorities on how they can best further the Liberal Democrat’s aims. As long as you are saying one thing, and my local Liberal Democrats in positions of power and influence are doing another I am not going to be able to consider the Liberal Democrats as a credible party. It is not just TASERs, other elements of your civil liberties campaigns could be effectively be fought in Police Authorities, for example I observed a recent authority meeting where the expansion of the Contact-Point database was discussed; it was being promoted by Conservative and unelected and unaccountable independent members without effective opposition from the Liberal Democrat member.